At Oxford Accident Solicitors we are regularly called upon to give legal assistance to people that have been involved in road accidents that were not their fault. Increasingly, that means accidents caused by drivers concentrating more on their mobile phone conversations or text messages than what’s happening around them on the road. Using a handheld mobile phone while behind the wheel of a car is an incredibly dangerous issue, one which Prime Minister Theresa May has pledged to make as socially unacceptable as drink-driving. 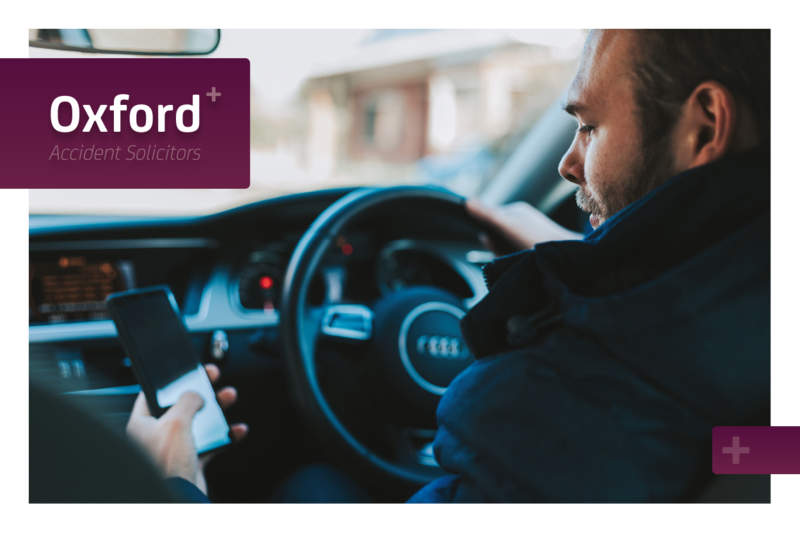 Due to growing media attention and increased lobbying from motoring organizations, the government took action and strengthened the penalties for those caught using a handheld mobile phone while behind the wheel. Despite it being illegal to use a hand-held mobile or satnav while driving, one in five motorists admit they check social media in traffic, according to a RAC Report on Motoring and almost one in two drivers will use their phone for calls while stuck in traffic. Worryingly, 14% say they take images or video while driving, 20% have written emails, texts or social media updates behind the wheel, and 6% admit they use their hand-held phone “most or all of the time” while driving. The RAC Report says, “It is difficult to say to what extent the distractions from hand-held mobile phone use cause accidents, but it is likely that official statistics understate the problem”. In other words, however alarming the stats are, the reality is probably even worse still. It’s also worth noting that the law against using a mobile while driving still applies if you’re stopped or queuing at traffic lights, or supervising a learner driver. In fact, the only times you can use a hand-held phone while at the wheel are if you’re safely parked or you need to call 999 or 112 in an emergency and it’s unsafe to stop. As for the deterrents, you can now get 6 penalty points and a £200 fine if you use a hand-held phone when driving. You’ll also lose your licence if you passed your driving test in the last 2 years, and you can get 3 penalty points if you don’t have a full view of the road and traffic ahead or proper control of your vehicle. You can even be taken to court where you can be banned from driving or get a maximum fine of £1,000 (£2,500 if you’re driving a lorry or bus). So, remember, it’s good to talk, but not when you’re driving. As for the brick-sized phone Bob Hoskins brandished in those BT ads, it’s fair to say technology has moved on slightly! If you are the victim of a road accident that is not your fault, don’t hesitate to contact Oxford Accident Solicitors for a FREE, no obligation assessment of your right to accident compensation.